"How did he get over there?" That's a phrase we hear a lot lately around our house. Luke can't walk more than a step or two, so how does he manage to make his way from the family room all the way into the kitchen? If you think the answer is crawling, think again. Luke would rather stand up holding onto a chair all day than crawl anywhere. Crawling is functional, but cruising is fun. 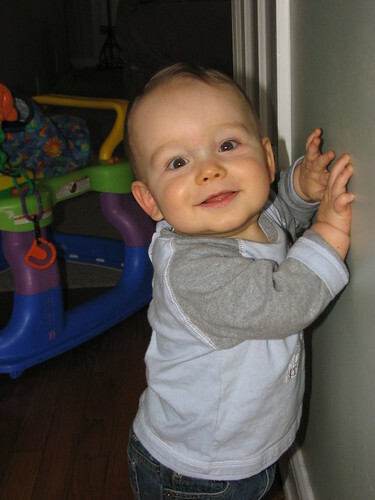 For those of you who aren't familiar with toddler lingo, "cruising" is walking around a room by holding onto things, usually furniture, for support. I say usually furniture, but Luke will cruise along anything that he find convenient, including adults' legs, Toby (not very effective), and now, the wall. 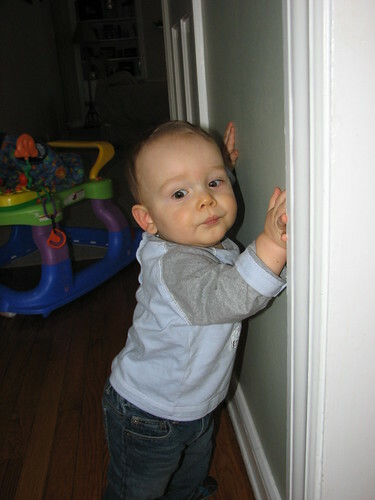 So now we've finally discovered how Luke is mysteriously appearing in other rooms: he's using the walls to get around. Here's a series of pictures we took to illustrate his strategy. Step 1: Keep your eye on your destination. Step 2: Grip the wall with your fingertips. Step 3: Carefully keep your balance.